Nailing down the perfect web design for your small business can be tricky, especially when Internet trends are always changing. Redesigning a business’s website to stay relevant may seem like a difficult task, so here are some tips to get you get through it. Having defined personas and personalization in your design will help you target your audience more directly. A study from Infosys revealed that 74% of customers are frustrated when their experiences aren’t personalized, and more than half found that personalization affects their purchasing decisions. Finally, the research firm Gartner found that such personalization can increase a business’s profits by 15% by 2020. How does personalization translate to web design? If you have distinct buyer personas for your different customer segments, then consider designing landing pages that target each of them. When you avoid the one-size-fits-all approach to landing pages, you can speak directly to customers and improve conversion rates. When you redesign a website, you want to make sure you connect with social media — if you haven’t already. This means you should add follow buttons and social share buttons in obvious places so your website visitors can find you on social media as well. According to a Shareaholic Social Media Traffic Report, at least a third of your traffic will come from social media, so the connection to your website is essential. Here’s a common mistake: many businesses include a button to “share on social media,” a function that rarely gets used. Instead, add buttons that link directly to your business’s social media channels. Integrating your search engine optimization (SEO) strategy into your web design will affect how easily your targeted consumers can find you using search engines like Google. SEO is especially important for e-commerce sites because Internet searches are still the number one source of referral traffic, according to the review software company Yotpo. Another thing to keep in mind when redesigning a website is planning ahead to add new content to your website. The more content you have, the more visitors you will have as a general rule. You need to be prepared to add new pages and update the content to generate more traffic and stay relevant. Last but not least, remember that there are experts in the website design field that can help you. 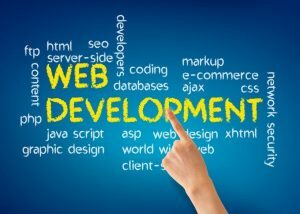 If you are way over your head when it comes to business web design, you can potentially waste a lot of money and time trying to do it all yourself. You can hire a website redesign expert instead. When redesigning a website, make sure you keep personalization, social media, SEO, content growth, and professionals in mind so your site can reach its optimal potential. You only have 10 seconds as a website owner to make an impression and tell your customers what they’ll get out of your company. After those few seconds are up, or even before that, they will leave if they don’t get the information they want. This is why redesigning a website is so important, so you can keep your customers on your site and increase your business’s success.